A former student, Archibald F. Nicoll O.B.E., is appointed Director (1920–1928). John Weeks is appointed to a part-time position. Instruction in the crafts and architecture is gradually phased out between 1920–1930, due in part to the establishment of rival institutions. An increasing emphasis is given to drawing and painting. During the 1920s and 1930s the art school develops the reputation as being the foremost and most progressive in the country producing some of New Zealand's most promising artists of the period. Dressmaking and millinery classes are held in the needlework room. Special classes this year include millinery and dressmaking (art), illustrating (commercial, fashion, book and newspaper). Rata Lovell-Smith is appointed to staff (1924–45). 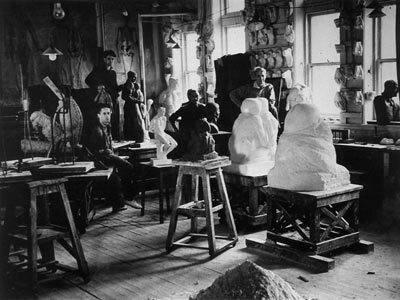 Francis A. Shurrock (RCA graduate 1909–13) starts at the School as Modelling Master (1924–48) Over the next 24 years Shurrock, as a sculptor and inspired teacher, exerts a considerable influence on a whole generation of Canterbury students. Hilda McIntyre (sister of the painter Raymond McIntyre) is employed (1925–38) as a part-time teacher of design and embroidery. Louise Henderson (née Sauze, of Paris) is employed as an instructor of design and embroidery (1926–33). James A. (Johnny) Johnstone is appointed to staff as Crafts and Design Master (1926-, Senior Lecturer 1949–58). Trained at Edinburgh College of Art, Johnstone was instrumental in the development of art metalwork at the school. From 1926, senior student Chrystabel Aitken assisted Francis Shurrock with junior modelling classes (1926–30). The School of Art becomes a special school of Canterbury University College, and the Diploma of Fine Arts is approved by the University of New Zealand. Colin Lovell-Smith is appointed to staff (Careers Advisor 1927–38, Acting Head 1945–46, Director 1947–60). Senior student Florence Akins appointed to part-time staff (with Gladys Anderson and Ivy Fife) teaching drawing and plant-form design and later design. She taught full time 1936 to 1966, and retired in 1969. Archibald Nicoll resigns as Director to become a full-time painter. Richard Wallwork, A.R.C.A. becomes Director (1928–45). Other staff appointments made in 1928 include Leonard Booth (1928, 1933- ); Florence E. Akins appointed initially part-time (staff 1929–31, 1936–66, Lecturer 1936); Rata Lovell-Smith (equivalent full-time Lecturer, 1928–45), and A. Elizabeth Kelly (equivalent full-time Lecturer 1928). The School is approved by the University of New Zealand for the award of the Diploma in Fine Arts. A site for a new School of Art at the corner of Montreal and Gloucester Streets (on Ross House site) is purchased, but this plan is thwarted by the Depression. The Christchurch Art Gallery opens on the site on 10 May 2003. 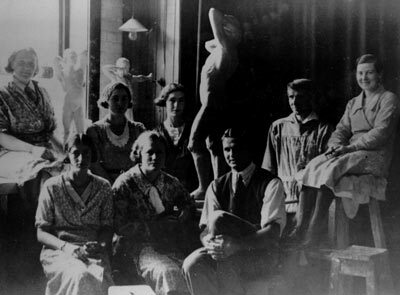 Lecturer Francis Shurrock and his class are working in the school's sculpture studio, known today as 'Annie's Wine Bar'. As an ongoing research project we seek further information (including comments, queries, anecdotes and photographs) relating to the history of the School of Fine Arts at the University of Canterbury. Please contact us on Ph: +64 3 941 7367 or Fax: +64 3 941 7301 or art.gallery@ccc.govt.nz. The information provided may or may not be published on this website.